The International Erasmus Games - IEG are an international event that gathers Erasmus students all over Europe and it started with the positive spirit of ESN Italy and ESN Poland in 2014. This event focuses on promoting a healthy lifestyle and good sportsmanship. 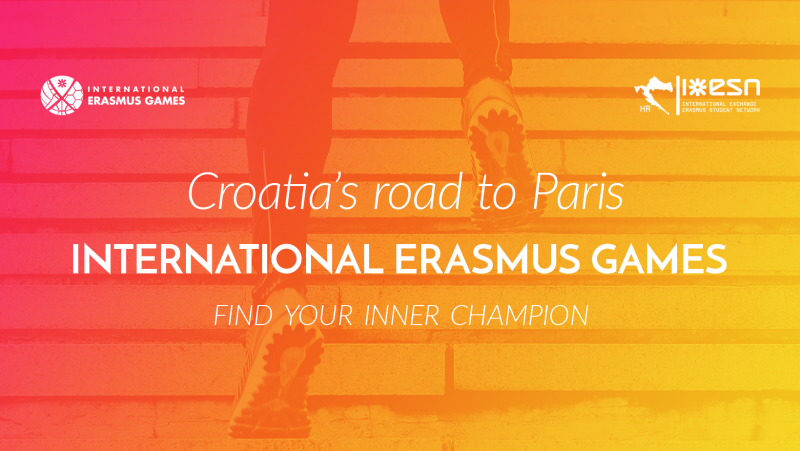 Every year, after national qualifications, young people from all around Europe come to the final competition, the International Erasmus Games, to try their luck and bring the victory to their home or Erasmus country. The event counts a great number of participants, which can count up to several hundred and we expect nothing less this time around! International Erasmus Games include 4 main sports disciplines: FUTSAL, BASKETBALL, VOLLEYBALL and ATHLETICS. and do we even have to say this...well, ok - PARIS! The goal is to have a delegation which consists of 20 students and will represent Croatia in Paris. May the best team - win!